Nestled between the peaks and tall pines of Oregon’s Deschutes National Forest, and offering a vast shoreline access to a plethora of water borne activities and breathtaking vistas, Odell Lake Lodge & Resort is every sportsman’s paradise, lover’s hideaway, and family recreation cornucopia. It’s also the home of a 33 year-long tradition of laid back, down-wind “races” across the lake -followed by tall tales, a great BBQ and warm hospitality from John and Janet Milandin. 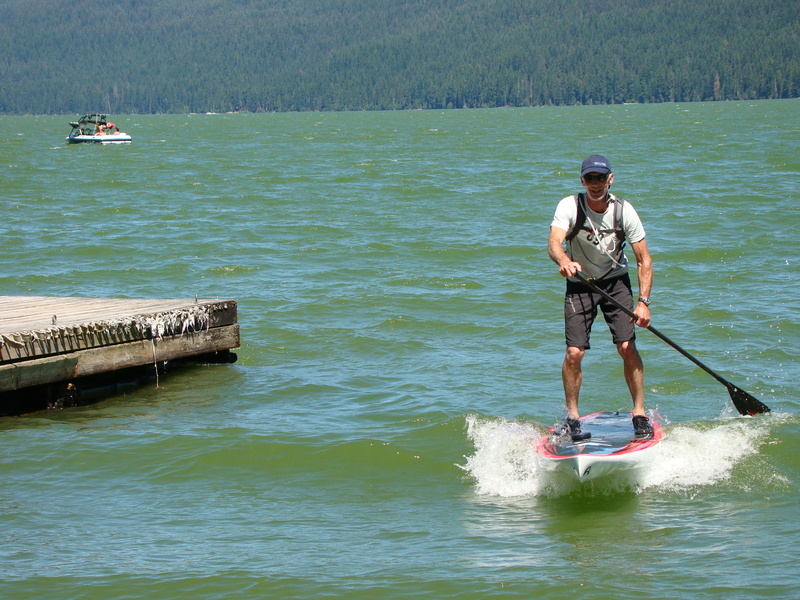 Central Oregon SUP paddlers join surf skis, canoes, kayaks, outriggers – anything that can be paddled – for this annual event. In windy Central Oregon we often curse the blasting winter blizzards that hit us while we ski, toss us around as we cycle and push us back as we paddle upstream in the Deschutes. This same wind becomes our friend when we plan to let it hit our backs and give us some great glides as we paddle the 6 miles from Shelter Cove to the Odell Lodge. In the mix of paddle craft on the water, there were 11 standup boards. That group consisted of 10 guys and one grandma (yup, me). For the life of me I annot figure out why there weren’t 3-4 times as many SUP paddlers and at least a few dozen women. Here’s the opportunity missed (but easy to access almost any time. The “race” is not a competitive monster in which anyone needs to grind out a personal best time. John Milandin specifically guides the “race” spirit. Go Granny! 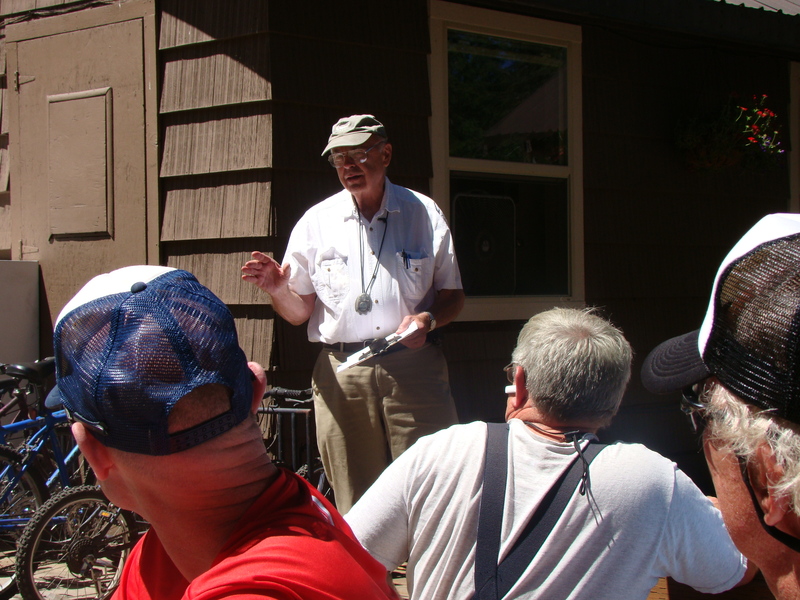 We need 15-20 women for Odell Lake 2014. We all get on the water and hunt for little waves here and there to play on for a delicious 6-mile paddle. The wind always seems to bolster up a bit by mid-course, so the glides get longer and the assistance gets stronger. If you have never tried a down winder there couldn’t be a better (and safer) situation. Everyone is required to have a PFD and a whistle. Crash boats circle the course and watch out for wipeouts or stragglers. The more participants the greater the chance you will be paddling for an hour or so nearby someone who’s all, “Wooohooo!!! !” after a glide. The energy is refreshing. A number of us had so much fun that we are returning to Odell Lake on the next windy weekend with our own shuttle planned just so we can ride the glides again. 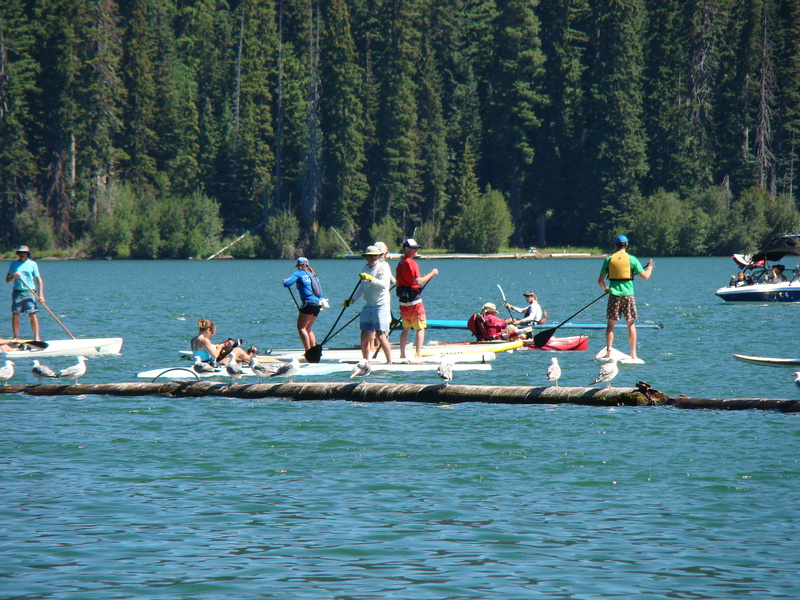 Take a look at the video below to get a sense of the spirit of fun at Odell Lake. If you are looking for the results of the”race,” you won’t find them here. Grins and friends set the tone of the day, not times or wins. Search your local paddling community for a similar lake event this summer. Register, prepare and then go have fun. It’s a win-win for sure. 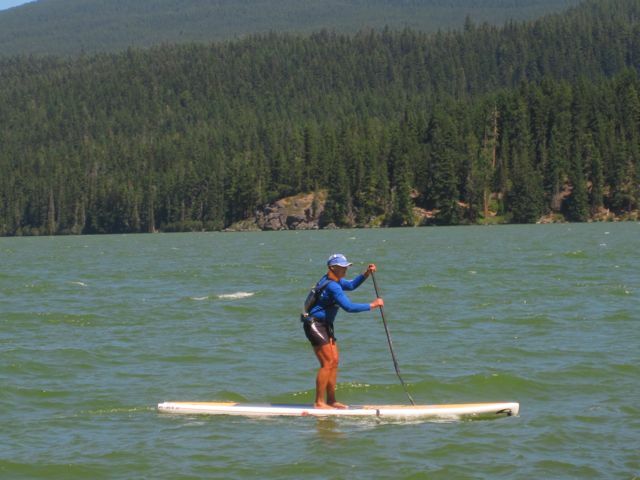 This entry was posted in Lakes & Bays, SUP Community, SUP Racing and tagged Deschutes River, elder sup, John Milandin, Odell Lake, SUP paddling by Water Words. Bookmark the permalink.